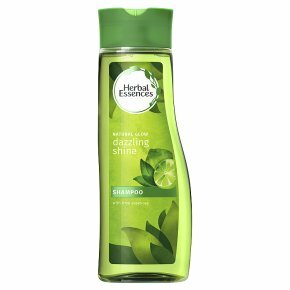 Turn the spotlight on for normal hair, don't just clean up your act, Herbal Essences Dazzling Shine Shampoo will make you shine like a star! This nature inspired cleaning formula will let your beauty shine through while leaving your hair with a refreshing citrus scent. The Dazzling Collection: May you shine like the star that you are. Why not go for the gleam you've dreamed of? This fabulous Dazzling Shine collection with citrus scent will add flare to your hair, turn the spotlight on it and shine like a star! It'll switch on your shine for normal hair in 3 ways: 1- Shine shampoo / 2- 2in1 Shine shampoo & conditioner / 3- Shine conditioner. All day radiant shine for your hair. Shine shampoo for normal hair with refreshing citrus scent. Enjoy bright Citrus essences. Infused Fragrances Nature Inspired. Turn the spotlight on for normal hair, don't just clean up your act, Herbal Essences Dazzling Shine Shampoo will make you shine like a star! This nature inspired cleaning formula will let your beauty shine through while leaving your hair with a refreshing citrus scent. For better results use with Herbal Essences Dazzling Shine Condtioner.